Have you been eyeing a great pair of cowboy or western boots, but aren't sure how to meld them with your city-chic style? Lucky for you this season is chock-full of trendy pieces that will pair with your favorite pair of cowboy boots and still earn you street cred for style. Ponchos and tribal knit sweaters are hugely on trend this fall. Pair them with leggings and a knee high boot like these beautiful leather Pikolinos or wear them with boot cut jeans and a fab pair of Naot Sirocco ankle boots. Don't forget a fabulous tote - we can't resist this studded version from Frye. Looking for something a little more girly? You can't go wrong with fringe and lace. The delicately embroidered Taos Priviledge and the comfortable and textured Verga by Blondo (available in store) add a western flair to these beautiful pieces. But don't worry you can mix and match with your sky high heels too. Complete the look with a fab clutch, like this pretty lady from Frye. 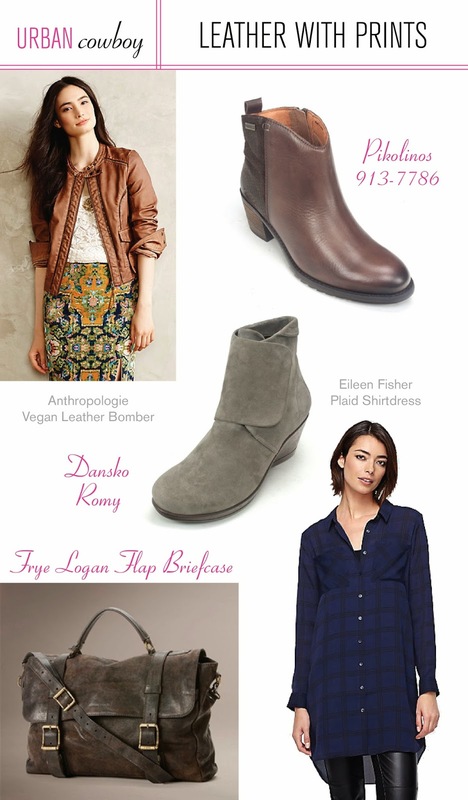 For ulitmate versatility mix your favorite florals or plaids with a leather anchor piece (like a killer bomber jacket or stunning pants) and add an understated country boot, like these brown leather booties from Pikolinos (in store) or classy suede wedges from Dansko, to polish it up. Adding a weathered leather satchel for texture will bring it all together.